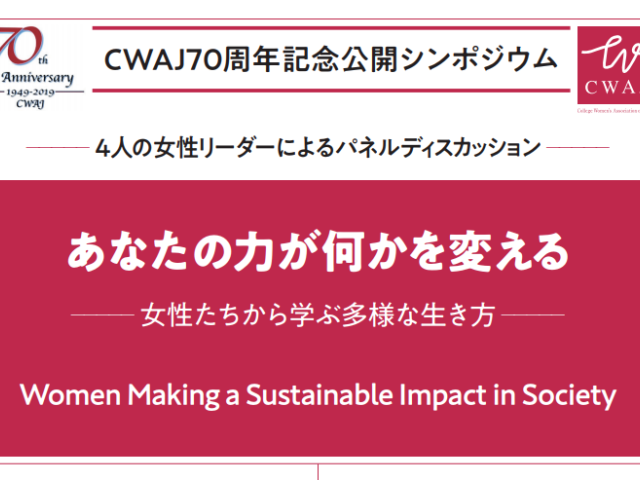 2019 marks the 70th anniversary of The College Women's Association of Japan (CWAJ) which provides an opportunity to reflect proudly on CWAJ’s seven decades of promoting education, art, community service and cross-cultural understanding. In celebration, CWAJ invites you to a panel discussion on the dramatic change in the social environment for women in Japan. Four women in leadership positions will speak to the necessity for diversity in lifestyle brought by these societal changes. They will discuss their views on and experiences of women’s participation in society, education and leadership. The panel will be followed by a networking reception to allow for an exchange of views and conversation about shared issues. The symposium will be held in Japanese with simultaneous English translation. Yoko Tokunaga, Representative of Fundraising Labo. The greatest impact a woman can make on society is to raise her children with loving care and attention.